Grout haze obscures the beauty of your tile, making your new wall or floor look grimy and worn. Repeatedly spraying it with tile cleaner or scrubbing with an abrasive pad won’t remove it and may only damage your tile. It is possible to completely remove this film, but you’ll need the right product and the right approach. Grout haze forms when the grout wasn’t completely cleaned from the surface of the tiles soon enough after installation. As the grout cures, the water it contains evaporates and the solids stay behind, adhering to the surface of the tiles and forming a streaky, hazy-looking layer that dulls the color and shine of the tiles. Some amount of grout haze is almost inevitable because the grout must be smeared on the tiles in order to fill the gaps between them. The remaining residue can’t be removed until the grout has cured. The less time the grout has had to dry, the easier any leftover haze will be to remove. If you spot the film appearing within 24 hours after the tiles were installed, you might be able to remove it just by scrubbing it with a nylon scrub brush or pad dipped in a bucket of warm water. When you’re done, use a microfiber cloth or terrycloth towel to dry the tiles and buff them to a shine. If that doesn’t work, fill a container with a solution of 50 percent water and 50 percent vinegar. Dip your nylon brush or pad in this mixture and scrub the tiles forcefully. If you need to clean grout haze from an entire floor, you can apply the solution with a mop, but you’ll still need to scrub the tiles and mix up a fresh batch of vinegar solution once the first becomes dirty. Again, use a microfiber cloth or terrycloth towel to dry and buff the tiles. You can also try using a grout sponge, which you can find in the tiling section of a home improvement store. Use only those sponges intended for use on tile. Anything rougher, such as a scouring pad, could cause damage. Use the rough side of the dry sponge to gently scrub the haze off the tiles. Finally, vacuum the floor to remove the grout dust. These solutions are worth trying if the grout haze hasn’t been there more than a few days. If the filmy residue just won’t budge, though, move on to a commercially available cleaner to avoid scratching or otherwise damaging your tiles. Once the grout haze has been there more than a day, it’s effectively cured and you’ll need a cleaning product specially formulated to remove it. This is especially true for unglazed tiles, which absorb grout more easily than glazed tiles. Grout haze remover is available in the tiling section of most large home improvement stores. 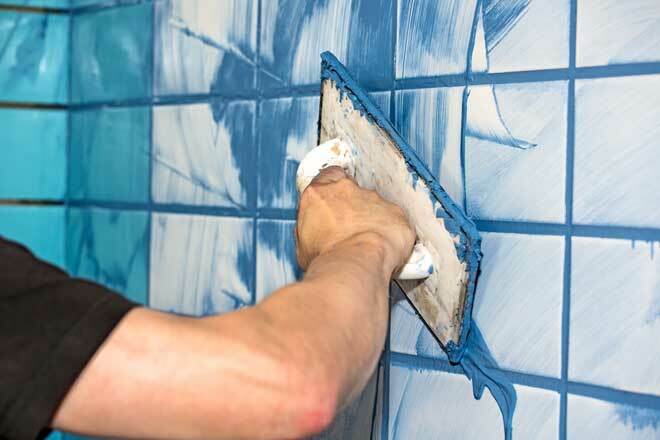 If your tiles were installed with epoxy grout rather than standard cement grout, look for a product designed for all types of grout haze or specifically for epoxy grout haze. While grout haze removers are formulated for use on tile, there are many types of tile and they don’t all react the same to the various chemicals in cleaners. If your tiles are made from marble, travertine or another acid-sensitive stone, avoid acid-based cleaners and look for products labeled safe for these types of tiles. To make sure the cleaner won’t stain, etch or otherwise damage your tile, patch test it on an inconspicuous part of the wall or floor, such as inside a closet. You can also use a leftover tile. Cleaning products vary in the way they’re used, so follow the directions exactly. Before you start, sweep or vacuum the floor to remove any material that could react with the cleaner. Grout remover is mildly caustic, so when you’re ready to apply it, put on rubber gloves to protect your hands from irritation. There are two ways to apply the solution. For small areas – If you need to clean just a few tiles, you can apply the solution either to a sponge or cloth or directly to the tiles. For large areas – To clean an entire floor or large wall, work on one small section at a time. Apply the solution directly to the tiles over a section no large than 10 square feet. Allow the cleaner to soak in for 10 to 15 minutes. After this time, run a sponge or nylon scrub pad over the area to mix up the solution, but don’t scrub. Mop up the cleaner, then mop again with plain water to rinse any residual cleaner or grout haze off the tiles. Grout haze that’s been left for 10 days or longer is exceptionally difficult to remove and usually requires a heavy-duty grout and tile cleaner. The grout between the tiles is well cured by this stage and won’t be harmed by strong tile cleaners, but these cleaners shouldn’t be used on grout that’s less than 10 days old. Again, before you use the cleaner, test it on a part of the floor or wall that can’t be easily seen. Apply the solution to an area of around 10 square feet and let it sit for just a minute or two. This stronger cleaner doesn’t need more time than this to do its job. Mix the solution around on the floor with a sponge or nylon scrub pad. Finally, mop the floor clean or vacuum it with a wet-vac. Rinse the floor with plain water and use a sponge or nylon scrub brush to gently remove any lingering residue from the tiles. When working with grout haze removal products, take care to use the correct concentration and rinse the floor thoroughly after cleaning. Using too high a concentration or leaving residue behind could soften the grout between the tiles to the point that you may have to remove and reapply it. Removing grout haze with homemade cleaners isn’t hard if you catch the problem within the first 24 hours. After that, though, this sticky film gets a lot more stubborn and you’ll find commercial cleaners specially formulated to remove grout haze give you the best results. Follow the product manufacturer’s directions exactly and you should end up with clean, bright tiles that look the way you expected them to when they were installed.